The global bio-tech flavor market is growing rapidly, owing to an increasing demand in the food & beverages industry. Besides, the regional government regulations on increasing use of bio-based technology boosts the bio-tech flavor consumption. Food & beverages manufacturers experienced increased sales of their products that are marked as natural and biotech. Particularly in Europe, where in 2015, out of every seven new beverages product launches, one was labelled as natural and bio-tech. As per Persistence Market Research analysis, global sales revenue of the bio-tech flavor market is estimated to be valued at US$ 906.7 Mn by 2016 end and is expected to increase to US$ 2,092.2 Mn by 2024, representing incremental opportunity of US$ 1,260 Mn between 2016 and 2024 and is expected to register a CAGR of 11.0% during the forecast period. Demand for bio-tech flavor is expected to grow at a significant rate over the forecast period, since bio-tech flavor manufacturers are developing new applications that are in the developing phase. Bio-tech flavors provide number of health benefits including enhancement of antioxidant levels, reduces the risk of metabolic disease including obesity and diabetes, which makes the consumer to consume bio-tech flavor based food and beverages over natural and artificial flavors. Bio-tech flavors have low shelf life as compared to the shelf life of natural and artificial flavors. As there is no added artificial compound such as artificial preservatives, the average shelf life of bio-tech flavors is around six months to one year only. Increasing shelf life of natural and fruity flavor is a real challenge in order to enhance growth of the global bio-tech flavors market. Mostly, vanilla & vanillin flavors are not used in soda drinks due to reaction issues. This is another growth restraining factor for the bio-tech flavors market in terms of value. Based on application type, the food segment is estimated to account for more than 55% volume share of the overall global market by 2016 end, which is expected to increase further by the end of 2024. The global bio-tech flavor market volume, by the food application segment is forecasted to register a single digit CAGR for the period of 2016 through 2024. Amongst the flavor type segment, the vanilla & vanillin segment is projected to be the most prominent segment over the forecast period, this is primarily owing to increasing demand of vanilla & vanillin flavor in protein bars, snacks, powder and protein drinks. As per Persistence Market Research analysis, the vanilla & vanillin segment, which accounts for more than quarter of the global bio-tech flavor market, is anticipated to register a CAGR that is estimated to be over 0.9% greater than the CAGR of the food application segment, during the forecast period. Besides biotech flavor in food application, the exceptional eco-friendly and healthy properties of bio-tech flavor in beverages and nutraceutical segments, its use is anticipated to increase by 2024. Non-alcoholic beverages segment is estimated to be the most prominent sub-segment in beverages application segment, which is anticipated to account for more than 70% of total beverages market in global bio-tech flavor market over the forecast period. Similarly in food segment, confectionery products are estimated to account for a majority of the share followed by dairy products. Currently, bio-based technology adoption is limited to fewer companies such as Givaudan, Symrise AG, International flavors & fragrance Inc. etc. This is due to high cost and less shelf life of natural and bio-tech flavor. Beverages application segment is currently the second most remarkable segment in the market, while the food application segment is projected to register an above average CAGR during 2016-2024. The nutraceutical application accounts for the smallest market share in the year 2015, is expected to observe a Year-on-Year growth rate of about 7.8% in 2016. 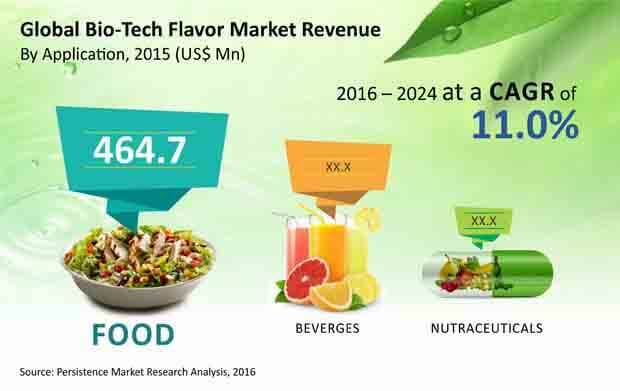 The Asian countries such as China, India, Japan and in Europe especially Germany are demonstrating a rapid growth in the demand for bio-tech flavors as compared with rest of the countries in the region. The key players in Asia Pacific region are undergoing capacity increase of bio-tech flavors with the increase use in food and beverages manufacturing. Givaudan S.A , International Flavors and Fragrances Inc. (IFF), Firmenich SA, Symrise AG, Takasago International Corporation, Sansient Technologies Corporation, Kerry Group Plc are some of the key players operating in the global bio-tech flavor market.